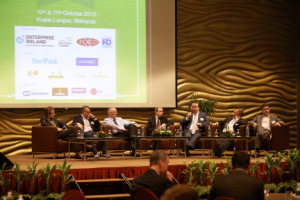 The 7th annual Asia Pacific Irish Business Forum took place in Kuala Lumpur at the Royal Park Hotel on 10th/ 11th October. Up to 200 participants from Asia Pacific and the Gulf attended. MOS Fergus O Dowd from the Department of Communications, Energy & Natural Resources and Environment represented the Government. The Deputy Head of DFAT’s Asia/ Pacific unit, Michael O Toole, was also present. Enterprise Ireland and NI Invest were major sponsors, NI Invest using the occasion to underline its efforts to raise Northern Ireland’s business profile in Asia. 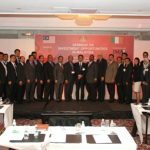 Other sponsors included FEXCO, ESBI, Kerry Group, PCH International, IMUC (Irish Universities Medical Consortium) and Openet, The event was organised by the Malaysia Irish Business Network led by Ron Anderson and supported by the Ireland Malaysia Association. The AIPBF was held on the same weekend as the Asian Gaelic Games which this year was hosted by Orang Éire GAA, based in KL. Martin Skelly, GAA Vice President, and Michéal O Muircheartaigh represented the GAA. This year’s programme opened with a reception and dinner on 10th October. Ambassador Kelly welcomed participants and launched the forum. On 11th October there were over 20 speakers divided into various platform sessions covering a range of business focused topics related to the challenges and opportunities in Asia including a breakfast seminar on doing business in Myanmar led by Ambassador Cole and Gareth McGeown of Coca Cola. This session concluded that although Myanmar offered huge potential as an emerging market the absence of infrastructure curtailed its capacity. The Forum also featured a regional DFAT Heads of Mission round-table, a presentation by Enterprise Ireland focused on client companies active in Asia, a presentation by Invest NI, a session led by Tony O Reilly Jnr of Providence Resources focusing on Ireland’s hydrocarbon licensing regime and potential opportunities for Asian investors, a presentation by Liam Casey of PCH International on the evolution of Ireland’s business engagement with China and a presentation on regulations governing intellectual property rights in ASEAN by Paul Kelleher from the EU delegation in Jakarta . There was also a session led by Irish Chambers of Commerce in the region. The programme also featured presentations by Christina Noble on child protection in Vietnam and Mark Rohan, a gold medal winning para Olympian. In his keynote speech MOS O’Dowd spoke of Ireland’s growing success in Asia including 8 Billion worth of bilateral trade with China, a 21% increase in trade with Vietnam, the fact that 20 Japanese companies are located in Ireland and the opening by CRH of a regional office in Singapore. The MOS emphasised his willingness to listen to participants’ concerns and to emphasise to the Taoiseach on his return the need to focus scarce resources on developing Ireland’s business profile in Asia.